Originally from Grand Rapids, Michigan Jordan received his BFA from the University of Alaska Fairbanks in 2005. Following graduation he spent a year working for a home builder in Fairbanks specializing in custom tile work. This along with other carpentry experiences peaked his interest in the use of hand guided tools as a means of recording movements. His interest in the gestural marks that tools make and the risk involved in tool use led him to explore these themes more deeply in graduate school at Washington State University where he received his MFA in 2008. 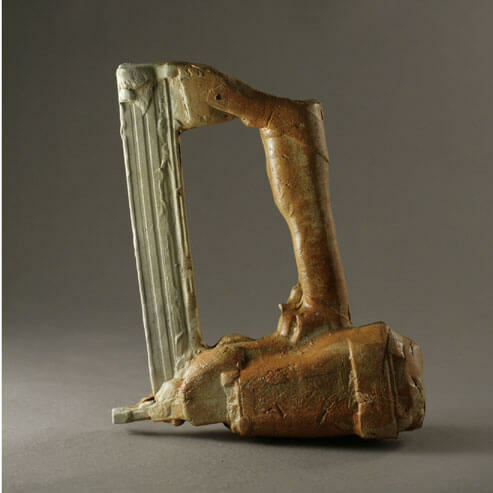 My ceramic sculptures reflect my interest in hand or tool processes and related objects. Tools fascinate me because of their strength and purpose. They appear superficially straightforward, but also incorporate complex histories of craft and construction. Being a youngest child of parents who were also youngest children, there is a large generational gap in my family; because of this most of my memories are connected to objects that were used by family members that are no longer living. Some of my most vivid memories are of working on my grandparent’s farm in Michigan. I still have and use some of the tools from that farm. All of the tools were spray painted fluorescent orange to prevent them from being lost; the paint would wear in areas of hard use. Repeated use wore the paint from the handles creating an interesting surface and memory of the user. It is this dialogue between a tool and its user that interests me. I make plaster molds from tools such as hammers, chisels, and wrenches to create artifacts in clay. The reassembled tool forms along with sculpted elements create objects referencing gesture and history. Clay is an ideal medium to mold; it is reactive to touch and can appear both durable and fragile. The press molded forms of hammers, nail guns, chisels, and wrenches are made quickly. At times the surfaces of my work appear crude; by making marks and objects in a spontaneous way the work remains honest and in tune with my process. In this way I build a history of events into the surface of the sculpture.